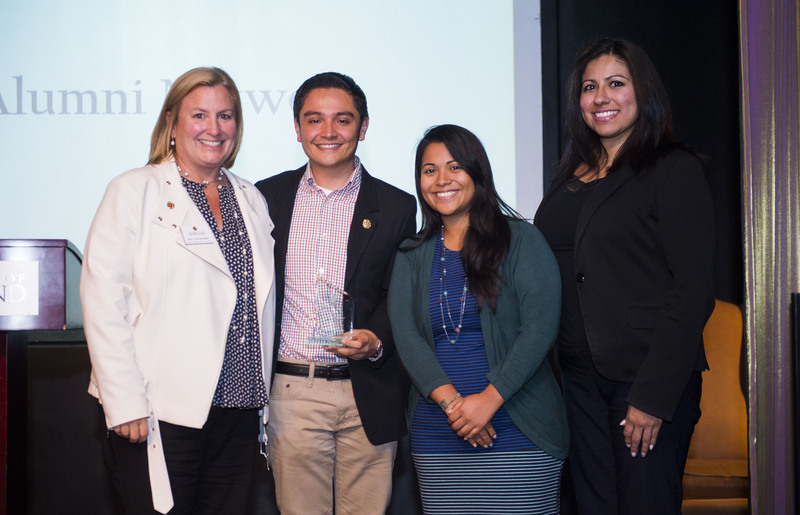 Gerson Elias '12, second from left, got involved with his alma mater to help restart the Latinx Alumni Network in 2014. Since then, he has helped grow LAN into an award-winning network that hosts a range of events for the Latinx Terp community. Check out our Q&A to learn more about the network and Elias! Being a network leader provides an opportunity for me to stay connected to UMD and to give back. I love planning and executing events that engage alumni and bring us back together, whether that is old classmates and friends or making new friends with alumni from different years. Why did you decide to become involved in the Latinx Alumni Network? After graduating, Pamela Hernandez, MICA's Latin@ Student Involvement & Advocacy Coordinator at the time, reached out to recent alumni leaders to start LAN back up. LAN was inactive at that point, and many recent alumni were interested in re-chartering. The momentum was building and I decided to take the lead. It's been four years now, and LAN continues to build its brand by delivering professional, social and community service events. How does it feel to see how the network has grown in the past few years? It's been such a rewarding experience to see LAN go from being inactive and having to be re-chartered in 2014 to winning "Network of the Year" in 2017 from the Alumni Association. I am especially happy to see the number of community service events we have hosted including connecting with UMD students and high school students in the area. My hope is the network continues to grow and gain more support, while at the same time serving the Latinx community at UMD. How have you volunteered outside of the university? Outside the University, I have served on the ALPFA DC board for almost five years first as Secretary and now as Director of Membership. With KPMG (my employer), I have volunteered at local elementary schools participating with Junior Achievement and KFFL. I was recently "crowned" Mr. Heart of Gold in a fundraising competition for Latinas Leading Tomorrow (pictured to the right). I also speak to middle and high schools in the area (ESOL students) and to youth groups at local churches. What advice do you have for new network leaders? I would encourage new network leaders to work with their fellow board members to be strategic and thoughtful in the events they plan. Not to focus solely on the numbers and having a great turnout, but to value the quality of the event and the relationships that are built with alumni and the community. Tell us your favorite memory of UMD. Aside from the people, student organizations, clubs and events, I miss our campus itself. The UMD campus is beautiful, and even though I complained about the long walks between classes, it's something that I miss. I'll never forget going through McKeldin mall on a sunny spring day and enjoying the beauty of our campus.